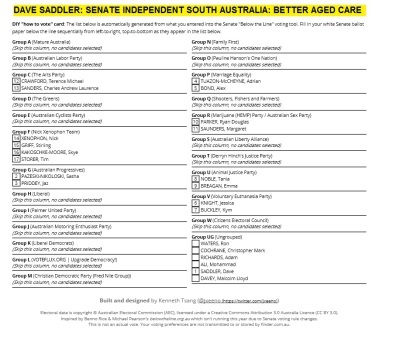 My name is Dave Saddler, and I am running as an Independent for the Senate in South Australia in the next Federal Election. I have worked in Age Care for ten years and intend to make Age Care the focus of my campaign and, if elected, the focus of my term. I believe Age Care is an important issue that is never given due attention either in election campaigns or by governments. It should be. The people I work with are the hardest working and most loving people you are ever likely to meet. They routinely work unpaid overtime for the sake of their residents. They are forever being given additional duties as the sector continues to try to do more with less. It is my understanding that a further $1.2B is to be taken away from age care at the federal level. This sector needs more funding, not less. Older people deserve the very best of care, not just because it is the right thing to do. And it is the right thing to do. The people I care for literally built this country and have paid taxes for forty to fifty years. Older people deserve the very best of care because they have already paid for it.